Thanks to riveting dramas like Mad Men, Breaking Bad and The Sopranos, many critics consider the last few years among the best television has ever known. While I certainly don't disagree with that idea, I'd be lying if I said I didn't miss the TV theme songs from my childhood in the '80s. Actually, there might be some great theme songs on the air right now, but I don't really watch sitcoms anymore, so I wouldn't know. 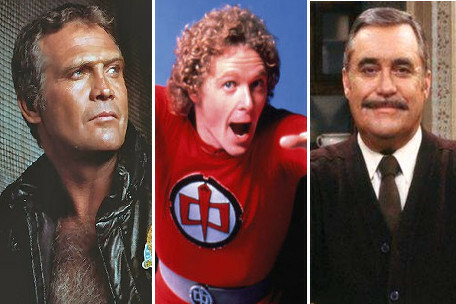 Being the nostalgic fool that I am, I was inspired today to write up a list of some of my favorite TV themes from the '80s, along with some trivia tidbits about each one. If you're in your late 30s or up, there's no way you won't know these songs. The crown jewel of this piece, "Believe It or Not" was one of the few television theme songs to have success at radio. Written by Mike Post and Stephen Gayer (more on them later), "Believe It or Not" reached the #2 spot on the Billboard Hot 100 when it was released as a single in 1981. After the song became a huge success, Elektra Records signed the theme's singer, Joey Scarbury, to a solo deal. His debut for the label, America's Greatest Hero, was produced by Post and featured songs written by Bruce Hornsby and Dan Seals, among others. Scarbury's solo career never really took off after the album, but he went on to sing more TV theme songs (Hardcastle and McCormick, Jennifer Slept Here, etc.) and write the #1 1990 country hit, "No Matter How High," for the Oak Ridge Boys. Before he became a household name in America playing Jason Seaver on the late '80s sitcom Growing Pains, Alan Thicke had a career as a talk show host and songwriter. The latter found him writing theme songs for television shows like The Facts of Life and The Joker's Wild. On the writing session for "It Takes Diff'rent Strokes," the theme song from Diff'rent Strokes, Thicke teamed up with his then wife, actress/singer Gloria Loring (their son is singer Robin Thicke), and the show's producer, Al Burton. "He and I wrote the themes to Diff'rent Strokes, Facts of Life," said Burton in an interview. "My original ambition was to be a songwriter, but then the world left me." Thicke also performed the theme song to his 1983 American talk show, Thicke of the Night. Check out our review of that track here. "Gimme a Break," from Gimme a Break! Written by Westcoast AOR greats, Jay Graydon and Richard Page, the second theme song for Gimme a Break! was used in Seasons 3 - 6 of the show. The song was performed by Nell Carter, the show's star and a former Tony Award-winning Broadway actress. Graydon and Page's theme for Gimme a Break! definitely sounds like a product of its two composers. With smoothed-out keyboards and a mid-tempo rhythm pattern, "Gimme a Break" sounds like something Graydon would have written for one of the Al Jarreau albums he produced in the early '80s. As iconic as it's become, "Where Everybody Knows Your Name," the theme song of Cheers, wasn't originally intended for the long-running comedy series. Originally titled "People Like Us," the song was written by Gary Portnoy and Judy Hart-Angelo for a musical they were working on called Preppies. After the producers of Cheers heard an early demo of the track, they asked the duo to change the lyrics around so it could fit the storyline of the series. Once the producers of the show agreed on a final version of song, they had Portnoy sing "Where Everybody Knows Your Name," instead of bringing in another vocalist. In 2013, the editors of TV Guide named "Where Everybody Knows Your Name" the greatest TV theme of all time. Speaking of Portnoy and Hart-Angelo, they also wrote "According to Our New Arrivals," the theme song to Mr. Belvedere. Like their theme for Cheers, "According to Our New Arrivals" was originally written for another project; the NBC pilot, Help. After Portnoy and Hart-Angelo changed the lyrics up a bit, the producers of Mr. Belvedere made "According to Our New Arrivals" the show's theme song. For the recording session, the producers brought in Leon Redbone, a singer known for his reinterpretations of early 20th-century ragtime and Tin Pan Alley songs. Redbone's "old-timey" vocals set the Mr. Belvedere theme apart from the rest of the shows airing on primetime during the late '80s. "The Unknown Stuntman," the theme song for The Fall Guy, was written by Glen A. Larson (also the show's creator), Gail Jensen, and Dave Somerville, a founding member of the '50s vocal group, The Diamonds. One of the most memorable TV themes of the '80s, "The Unknown Stuntman" was sung by Lee Majors, the action show's star. Ironically enough, early in his career, Majors (also of The Six Million Dollar Man) did some work as a stuntman. Although credited to Majors in its pilot, "The Unknown Stuntman" was then attributed to his character, Colt Seavers, for the rest of The Fall Guy's five-season run. "As Long as We've Got Each Other," the theme for the aforementioned Growing Pains, has quite an interesting history. The song's lyrics were by John Bettis, a musician also behind hits by The Carpenters ("Yesterday Once More," "Goodbye to Love"), Michael Jackson ("Human Nature"), Madonna ("Crazy for You"), and many others. The music for "As Long as We've Got Each Other" was composed by Steve Dorff, whose credits include "Through the Years" (Kenny Rogers) and the themes for TV shows such as Murphy Brown and Spencer for Hire. The producers of Growing Pains had fun with "As Long As We've Got Each Other," using nine different versions of the song throughout the series' seven seasons on ABC. I've included the B.J. Thomas and Jennifer Warnes (you know her from "(I've Had) The Time of My Life" from Dirty Dancing) version of the theme, but for Season 4, late British soulstress, Dusty Springfield, duetted with Thomas. The creator of Hill Street Blues, Steven Bochco, didn't want a typical-sounding, '80s cop show theme song (think CHiPs). Bochco brought in Mike Post for the gig, who ended up writing the theme for Hill Street Blues in just two hours after watching the pilot episode. Larry Carlton, an ace session guitarist who has appeared on hundreds of albums including classics by Steely Dan and Billy Joel, guests on the recording. The theme became a surprise hit at radio and also won the Best Instrumental Composition Grammy in 1981. Post went on to write the theme songs for L.A. Law, NYPD Blue and the Law & Order franchise, among other television shows. He also produced Van Halen III, the legendary hard rock combo's 1998 album featuring Extreme's Gary Cherone taking over vocal duties from Sammy Hagar. Composed by Charles Fox, with lyrics by Stephen Gayer (also the lyricist of "Believe It or Not"), "Together Through the Years" features vocals by Roberta Flack, a singer best known for songs like "Killing Me Softly with His Song" and "The First Time Ever I Saw Your Face." The show was originally titled Valerie, but after its lead actress, Valerie Harper, left the show following a money dispute, the title was changed to "The Hogan Family." After Harper left the series, the staff privately called the show "Throw Momma from the Series," a spin on the 1987 Billy Crystal film, Throw Momma from the Train. "Nothing's Gonna Stop Me Now" was co-written by Jesse Frederick, a singer-songwriter who released an eponymous solo album in 1971 on Albert Grossman's (Bob Dylan's then manager) Bearsville Records. After the record stiffed, and a subsequent band he started called The Kinetics also failed to connect with a big audience, Frederick set his sights on writing for television. "Nothing's Gonna Stop Me Now," from Perfect Strangers, was Frederick's first TV theme job. "Nothing's Gonna Stop Me Now" was performed by David Pomeranz, a singer-songwriter who has had songs cut by Barry Manilow, Bette Midler, and Donna Summer, among other artists.